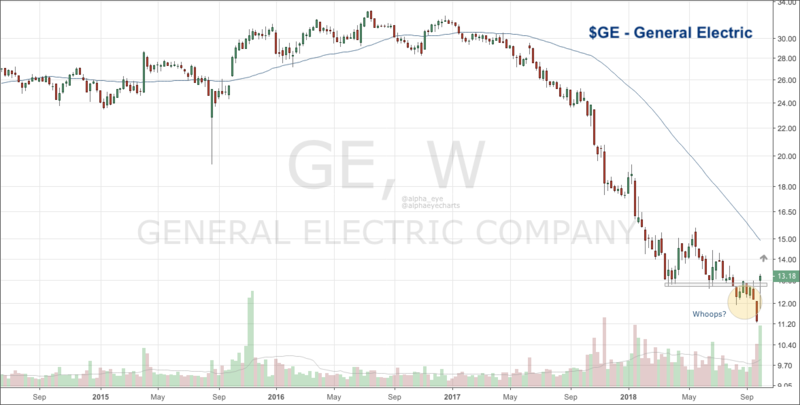 Is should be no surprise to anyone interested in the markets how bad General Electric’s stock (NYSE: GE) has performed over the past 2 years, down nearly 65% from December 2016. From late March to August, GE looked to be finding support around at the 12.75 level. That eventually failed, turning into resistance through September. This is called Polarity, which is nothing market participants haven’t seen before. On October 1st, news hit about a shakeup at GE (Disclosure: I don’t know what it was besides a new CEO and that is all I care to know.) Regardless, GE saw 350% above average volume come into the stock that day. I don’t know but the stock has gone nowhere but higher since then. When such a dog of a stock changes it’s character, it should not be ignored. If GE is above $13, I want to be long. With GE above that level, I see no reason why this cannot continue higher. I believe there is juice in this with such a potentially massive false breakdown setup and bearish sentiment towards the stock. Personally, I will be playing this trade with call options to help protect against any gap down risk. Let’s see what happens next. The author is currently long GE calls at the time of publication. Any opinions expressed herein are solely those of the author, and do not in any way represent the views or opinions of any other person or entity.